Features a number of single-player Mohawk chopper missions, from insertion (transporting doctors to a combat zone), extraction (retrieving injured NPCs and delivering them to a hospital), and even search and rescue, in which you look for lost hikers or downed pilots and ferry them back to safety. 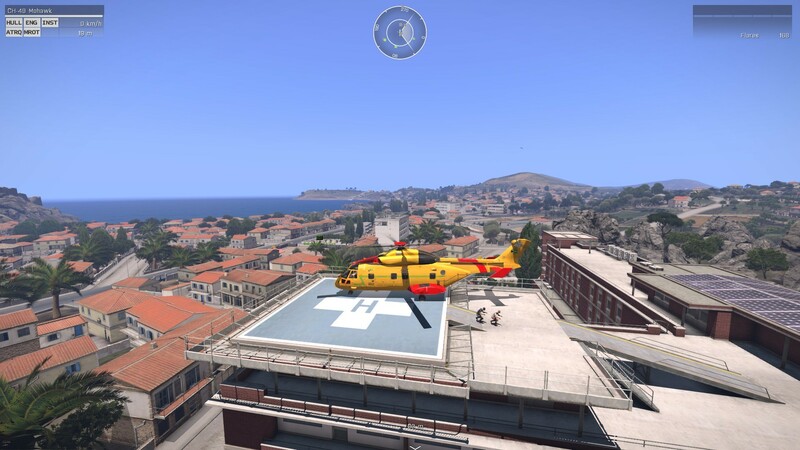 Enter the Pilot Civilian Air Rescue mod, which features a number of single-player Mohawk chopper missions, from insertion (transporting doctors to a combat zone), extraction (retrieving injured NPCs and delivering them to a hospital), and even search and rescue, in which you look for lost hikers or downed pilots and ferry them back to safety. It's a great way to hone your chopper flying skills offline while getting a warm and fuzzy feeling from helping NPCs in need. The mod starts you at your base, where you can get into flight gear and receive your first mission. There are options to choose from in terms of weather, forecast, and time of day, as well as the level of hostility you want to face when flying into enemy territory. I began by setting hostiles and antiaircraft fire to zero, but if you're more experienced, obviously, you'll probably want to ratchet it up to make your missions more challenging and exciting. If your mission involves delivering passengers, they'll be waiting for you in a polite crouch near your Mohawk. Also lets you learn the map due to the randomized placement of rescues.